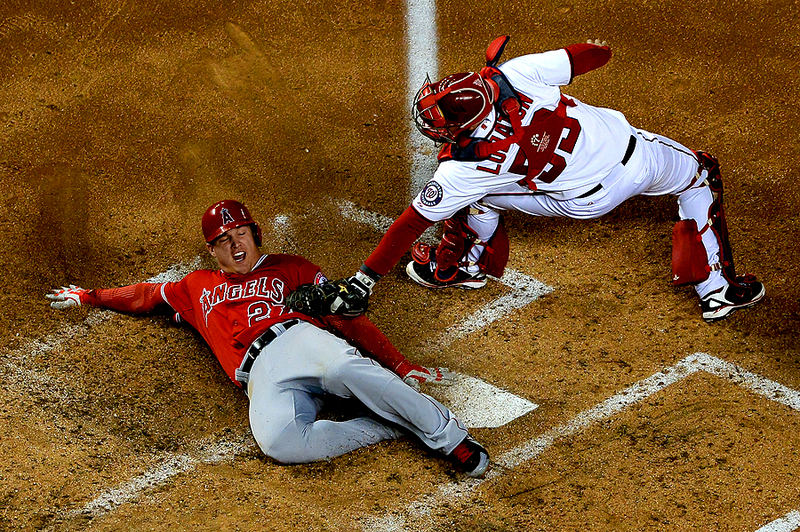 "Mike Trout #27 of the Los Angeles Angels of Anaheim slides safe into home plate as catcher Jose Lobaton #59 of the Washington Nationals cannot make the tag in the sixth inning at Nationals Park on April 23, 2014 in Washington, DC." As a photographer, you spend a lot of time working alone. And when you break away from the pack, which is one of the best pieces of advice I ever received, it's certainly lonely. After multiple consecutive nights of baseball games, I felt as if my images were looking the same each night from the field level. Shooting strictly from the photo-wells, I knew I needed to get away from the large group of photographers also occupying the same space and change my game plan. At Nationals Park, there is a lovely overhead vantage on home plate that is beautiful and clean. Around the middle of the game, I ventured to the upper deck hoping to see things different than the dozen or so shooting images at eye level with the players. Fortunately, it didn't take long, as Mike Trout of the Los Angeles Angels of Anaheim came sliding home to beat the tag and score a run enroute to helping his team top the Nationals for the night. With risk comes reward. Things don't always happen when you try to shoot differently, but when they do, it's a good feeling. 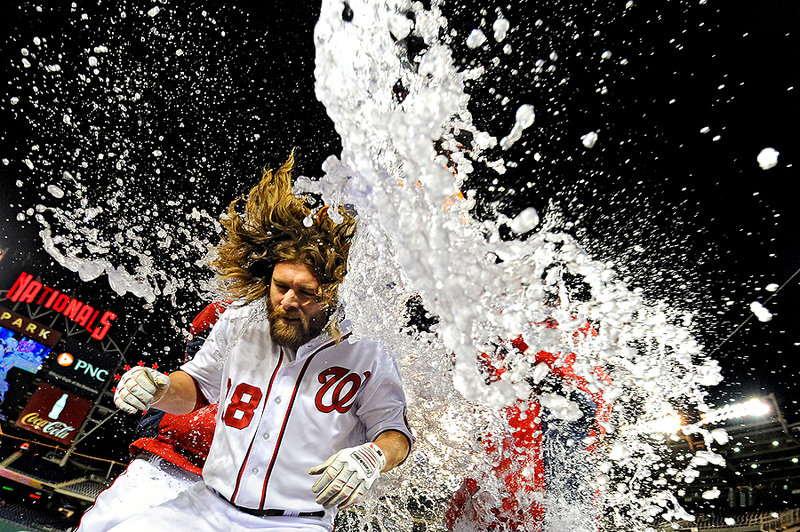 "Jayson Werth #28 of the Washington Nationals is doused with water by teammates, after he hit an RBI double to score two runs to tie the game in the ninth inning, against the Los Angeles Angels of Anaheim at Nationals Park on April 23, 2014 in Washington, DC. The Washington Nationals won, 5-4." Following an historic night of baseball, the Albert Pujols hype at Nationals Park settled as no players were scheduled to break any other records. However, more than three hours into the game, Jayson Werth of the Washington Nationals wanted to turn the attention away from the Los Angeles Angels of Anaheim and make the night interesting for Nationals fans. A great, but chilly night for pictures, the Nationals had one last opportunity to make the night their own. Down by three runs in the bottom of the ninth inning, Werth hit an RBI double to score two and tie the game. Then standing on second base, the next batter, Adam LaRoche, singled to score Werth - game over. It was nice to see such a contrast of moments between the two nights of baseball. From a humble celebration for hitting 500 home runs for Pujols, to living the dream of being the comeback hero for Werth. 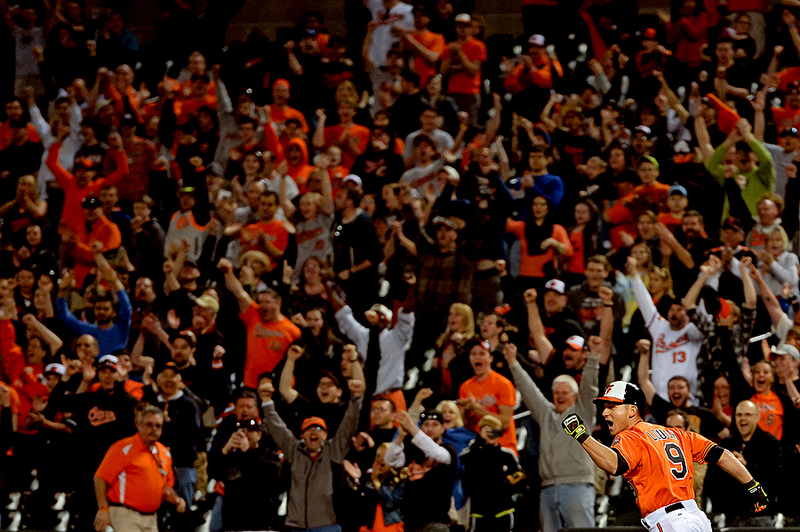 As a photographer, one couldn't ask for more exciting baseball so early in the season. 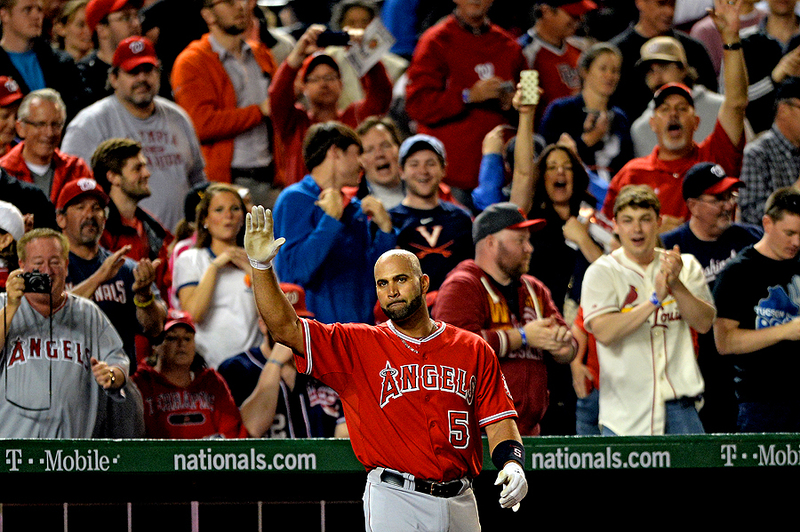 "Albert Pujols #5 of the Los Angeles Angels of Anaheim acknowledges the crowd after hitting a two-run home run against the Washington Nationals in the fifth inning at Nationals Park on April 22, 2014 in Washington, DC. The home run home was Albert Pujols' 500th." There is nothing better than documenting history. Every day and every game is historic for one reason or another, but milestones in sports make the typical day extraordinary. On Tuesday night, I had the opportunity to capture for Getty Images, all-star slugger Albert Pujols of the Los Angeles Angels of Anaheim becoming the newest member of the 500 home run club after belting two homers against the Washington Nationals. A lot of images from the night stand out, but this subtle image not only shows Pujols paying respect to the fans of baseball, but that he was humble, proud in the moment. With adrenaline running, it's incredible that he isn't grinning from ear-to-ear after surpassing a record only 26 before him have done. That's true sportsmanship during an amazing night of baseball. "Kyle Busch, driver of the #54 Monster Energy Toyota, leads Kyle Larson, driver of the #42 Cartwheel Chevrolet, during the NASCAR Nationwide Series O'Reilly Auto Parts 300 at Texas Motor Speedway on April 4, 2014 in Fort Worth, Texas." The saying goes: Everything is bigger in Texas. On Friday night, while the NCAA Final Four tournament was preparing for the weekend just up the road in Dallas, I was apart of the Getty Images team documenting all the stock car racing action at Texas Motor Speedway. Upon arrival, everyone on the squad was given an amazing view - a view that illuminated the mile and a half track unlike any other track in the country, or world, at that. That's because the speedway unveiled their new, Guinness World Records breaking television - Big Hoss. It's currently boasted as the largest high-definition LED screen and bigger than the screen at AT&T Stadium where the Final Four was taking place all weekend. While I'm sure the latter feels bigger being inside the stadium, this screen was simply enormous and a lot of fun to look at - crystal clear no matter what time of day. 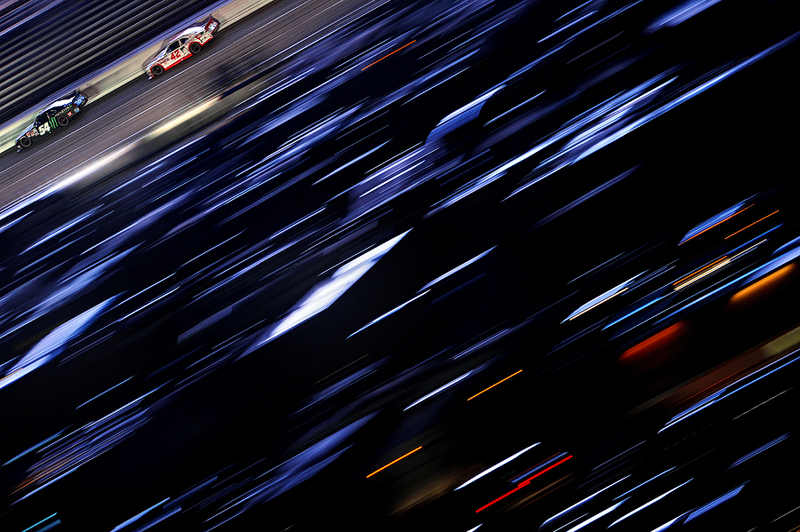 As the race took place Friday night, we all documented the screen at various angles. But what kept catching my eye was how its brightness reflected, lit up the back stretch of the track. I continually found myself working the above image. While a fairly typical panning photo in motorsports, I loved the galactic feel as haulers and campers glowed a cool blue hue from gigantic screen as the tiny cars raced by.